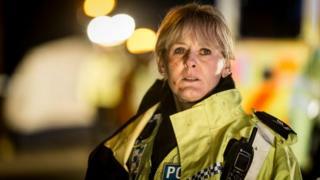 BBC shows Happy Valley, The Missing and Marvellous have won multiple awards at the Monte Carlo television awards. Happy Valley won best European drama series and Sarah Lancashire was awarded outstanding actress in a drama series. The Missing won best mini series and outstanding actress for Frances O'Connor. Marvellous picked up three awards - best television film and outstanding actor and actress for Toby Jones and Gemma Jones. Crime drama Happy Valley was a ratings and critical hit when it was first screened in 2014. It followed police sergeant Catherine Cawood, (played by Lancashire) who stumbles on a kidnap plot as she pursues a man she holds responsible for her daughter's suicide. Written by Sally Wainwright, it won a TV Bafta for best drama and a new series is due to air this year. Also set to return is fellow crime drama The Missing. The drama starred James Nesbitt alongside Frances O'Connor, as parents of a boy who goes missing on holiday in France. TV film Marvellous has been nominated for numerous awards. In the true story, Toby Jones played Neil Baldwin, a man with learning difficulties who does not let them hold him back from leading an extraordinary life. Jones won best actor at the Broadcasting Press Guild awards for the role. Also at the Monte Carlo Television festival, the Amade prize was given to ITN for their report on The Desperate Struggle To Save Iraq's Yazidis.